To celebrate their 25th year, Tasdance presents a triple bill of new and existing works by Australian choreographers. The Earth Beneath our Feet is at once entertaining and challenging, offering a range of choreographic styles that cross generations. 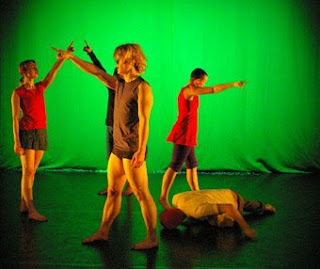 As the Crow Flies, by Nanette Hassall, was originally performed in 1988, by the recently disbanded Melbourne company Dance Works. It is a masterfully structured piece, invoking gentle geometries through the careful use of space, timing and sinuously recurring movement phrases. Set to the orchestral strings of Shaker Loops by John Adams, both music and movement build from languidly graceful sequences to an energetic crescendo. It requires strong technique from the dancers, who achieved a good level of precision. Tanja Liedtke explores themes of construction and collapse in her new dance theatre piece, Always Building (pictured above). Incorporating a surfeit of bright costumes, props and movement ideas, the end result is disjointed and somewhat cluttered. While some inventive, clear images emerge, including a dioramic skyline of head-stand sky-scrapers, this draft needs more work to develop beyond the scattered building blocks. The most tightly focused and entertaining of the three works is A Volume Problem, by Byron Perry. Featuring small speaker cores which come to life in the hands of the dancers, Perry creates an amorphous, non-human world in episodic fragments. A duet for Trisha Dunn and Kyle Kremerskothen is particularly well crafted, their alien postures and wafting touches reminiscent of two animated anemones. With simple yet sharp lighting, set and costume design, the choreography is clean and creative, sensitive yet amusing. The six young performers of the ensemble generally handled the diverse program well, yet occasionally lacked cohesion and dramatic presence. In the ever-diminishing contemporary dance landscape, it’s wonderful to see a small company investing in the development and promotion of quality Australian artists.